I want to say just how crazy I think it is that people from all over the world read our little bike blog. I mean you start a blog and post articles so people will read it. That is the point, but I just think it’s super cool that people actually do! So, on my last post, Pascal, a rider from Belgium commented, mentioning that the weather was a bit gloomy there that day, and that he’s been reading up on our Transrockies adventures because he’s going to be racing it this summer. (I hope you don’t mind me singling you out here, Pascal) When I read that comment, I just thought ‘Huh… You know… How cool is that, that riders, like Pascal, from thousands and thousands of kilometers away are able to so easily read our stuff.’ Sometimes this big world seems small, indeed… So yeah, this comment of Pascal’s got me thinking about the Transrockies again. I know quite a few people racing it this year, and so I wanted to share another quick story from last year that I think is pretty cool. It was day three. 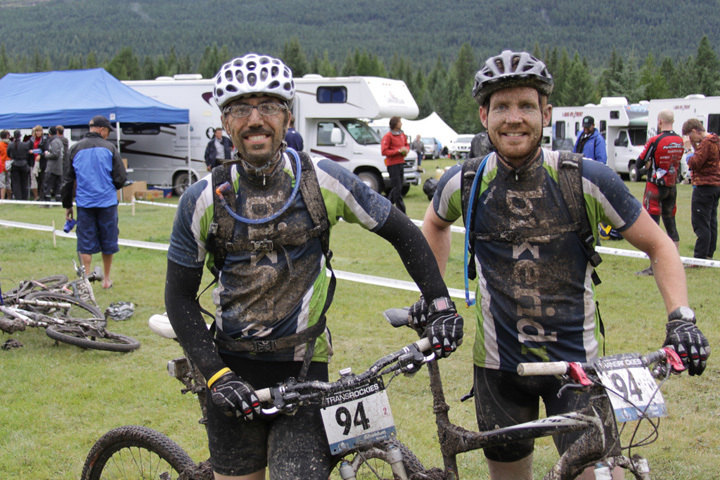 We were at beautiful Nipika for the Time Trail stage – 40 some km of epic Nipika single-track. Of course, it was raining though, just like it did most days on the TR last year, but Ken and I were pumped to get on the trails. It was supposed to be a ‘fun’ day and we’d been looking forward to this. Our startime was around 11am, I think. This was nice to start a little later on in the day, and not suffer the usual 8am start. Ken and I felt okay and rode steady for quite a while until we hit our ‘groove’ and started to catch a few teams that had gone out ahead of us – this always feels good. After two and a half hours or so, the rains had left a lot of the trails, especially the climbs and downhills greasy and slick, ‘unridable’ at least for guys like Ken and me. And here is one of the most beautiful things about the TR, the Elite/Pro level racers, who’d started around 90 mins after we did, caught up to us. In some ways this was really demoralizing! I mean you’ve trained hard for this race, and you’re out there going as fast as you can, hiking your bike up and down muddy mountains, over massive fallen trees and whatever else, and these guys who started way, way, WAYYYYYY behind you, catch up and pass you. But, at the same time, this is amazing! Ken and I were in one of the forested valleys when this happened. We could hear riders coming behind us, and quickly. Earlier, we’d actually even joked a little bit about when we thought the Elites would catch us. Some deranged small part of me didn’t think that would happen, but yeah, I was mistakin’ there. 1) We were honestly stunned to see these guys pass us so quickly and blow by us, hopping the log that we both heaved our bikes over. That was something else! We saw the finishing times at the end of every day, and knew how much the leaders of our category (Open Men) were beating us by, but to actually see them catch us like that really put it into perspective. 2) Despite that the fact that they were racing hard, probably freezing and just a miserable as we were, they took the time to cheer us on! That was cool. But you know, that’s the TR. It’s such a great experience because it’s such a great group of people, and event organizers that create this amazing Transrockies community. There is something to be said for riders in general though too. Riders are just kinda cool like that. Love this post. I recognize the ambiguous feeling with the elite riders totally. The atmosphere among the riders is one of the things I’m looking forward to the most. I’m sure it’s a bikers thing in general, but I’m hoping for even more of the same with the Canadian riders! Well Pascal, looks like we’ll be seeing ya at the 2010 TR. Ken and I are racing the TR3 this year! Looking forward to see ya there! Great news, see you there guys, absolutely! You can blame your sister for putting me onto your blog. Great stuff!